Every website / blog owner should know about SEO (Search Engine Optimization). Why? Because Search Engine Optimization forms the back-bone of your website. If done right, it can work wonders for your blog. Otherwise, your blog will be nothing but a large content farm with lots of content that is not being put to good use. As a result, the content (posts) grows old and rots away (becomes outdated). SEO is like the transmission of a car. No matter how big or powerful your engine is, if you have a faulty transmission, or no transmission at all, you aren't going to win any races. Hence for a blog, everything should be perfect, not just the content you write. We have previously written some similar posts on 13 Killer SEO Tips For Beginner Bloggers. Here, I will share some more of the tips, big and small, that I have learned. This is more of a checklist than anything, So take a look at it and see what you aren't doing. The title is the king of your content. It is the first thing web surfer looks at. It must be concise, informative, and eye catching. Google displays only up to 66 characters of a title. Therefore, it's a good idea to keep your titles short. However, don't restrict yourself to 66 characters only. Give include all the necessary information in your titles. We have written a post in length about this topic. How to Write Search Engine Friendly Post titles? Sitemaps are extremely important. And I can't stress this enough. 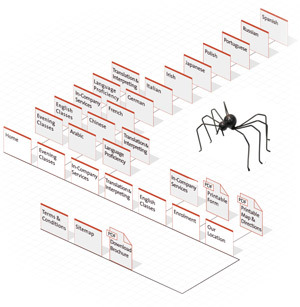 A sitemap is a list of all the pages present on your website. For search engines to index all of your pages, you need to create a sitemap of your website and submit it to all the major search engines. There are tools that generate sitemaps for you. But it is a long topic, which we have discussed in more detail in previous posts. In fact, these topics are covered in a SEO Series. This series can further help you to optimize your website for search engines. We recommend you take a look at all the posts in the series for a better SEO understanding. Keywords are the foundation of any search engine. Every search is performed based upon keywords. Users enter keywords in search bars rather than whole sentences. For your blog niche, you need to find out what keywords people are looking for. It would be such a waste if you have a good content but few keywords to take your post into a search list. Therefore, concentrate on using the maximum number of keywords in your posts, especially in the introductory paragraphs. Blogging is all about changing trends. Keeping in accordance with the current trends is a good way to keep search engines happy. Search engines like to see latest content on your blog. So keep a look out on the latest happenings around you, and blog about them. Also keep changing your keyword focus. Readers might not always be entering the same search terms. Such things are dynamic, and subject to change. Change your perceptions accordingly, and anticipate what the readers might be looking for. Use keywords accordingly. Interlinking is one of the most important part of SEO. Always link your new posts to the already existing relevant ones. 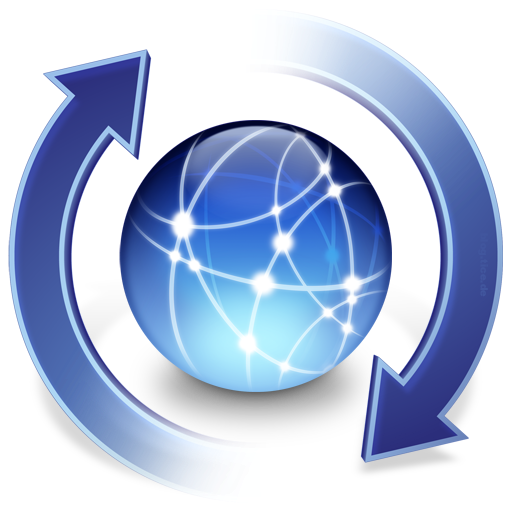 If your webpages are adequately linked, the older pages that have stalled and are getting lesser and lesser traffic daily will get a new life boost. Secondly, when a search engine sees many links, it knows that the website has a lot of content to offer. But if your pages are standalone, and have no linking, then the search engine might skip the un-linked pages. Not linking pages is a bad practice and should be avoided. Read out article on Interlink Pages To Flow The PR Juice. Putting your efforts in relatively newer markets can pay off if that market grows. Everyone is using popular networks like Facebook and Twitter to propagate their business. So chances are, you have a lot of competition in your niche. So why not try alternative sources as well? Sites like Pinterest are getting hot. And they are new, which gives you the perfect excuse to socialize on them! Does the content make sense? Have I used good grimmer and punctuation and made little spelling mistakes? It it worth sharing and linking? Does it have visual content, such as images or videos? Does it have examples, references, unique ideas? Is it interactive enough with the readers? Are there enough calls to action to invoke engagement? Does it ask readers questions about their own experiences? If your answer to most of the above questions is yes, then you have got yourself a good content. 8. How to name your files? This is a small, but very useful tip. Most people overlook it. Give your images and videos meaningful file names before uploading them to your website. 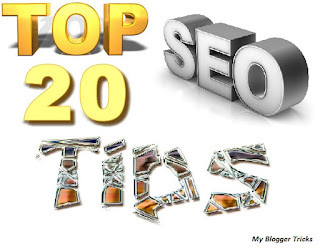 For example, instead of using a name like image007 for the intro image, I have named it "top 20 SEO tips". This helps in better search ranking and is a good SEO practice. To help search engines better index your webpages, you can add a file named robots.txt in your site's root directory. In that file, add a command "User-agent: *" (without quotes). What this does is, it invites bots to freely crawl pages on your website. Headings are a good way of organizing your content. 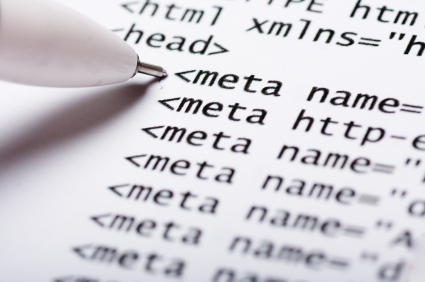 While writing an article, there are certain W3C guidelines that should be followed. In general, you should use only one h1 heading. This is for the title. Do not used h1 for any further sub heading. Use h2s for main headings. And if there are many main headings, then use h3 for all. If you want them to look bigger, just use CSS styling instead of changing heading levels. Also, number your headings if they have a list, such as this one. Social media is a great way of increasing backlinks, and traffic to your blog. Backlinks give you a better search engine ranking. It is a good SEO practice to add bookmarking tools for your readers. Add options for liking on Facebook, or Tweeting on Twitter so that your readers can reshare your content and spread the word. See our post on Social Bookmarking Widget For Blogger to learn more. Anchor texts can be as important as the links themselves. Use keywords instead of using statements like "click here" for links. It is a good SEO practice. Secondly, if you are linking to the same page multiple times, use different anchor text each time. Same anchor texts give the impression that the links have been automated. Search engines don't like auto-bots. That is the main reason why purchasing backlinks is discouraged, because they use the same anchor texts for your website everywhere. 13. 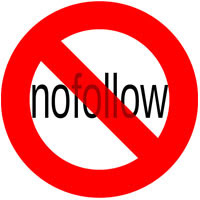 A word about "nofollow"
No follow is a good way of filtering lower quality websites that you are linking to so that it doesn't look like you are giving away backlinks. It also helps in maintaining a good sites-linking-to-you / sites-to-which-you-are-linking ratio. This ratio can seriously effect your Page rankings. Generally, put a rel="nofollow" attribute to links that go out to lower quality websites. Also, never add nofollow to any of your own pages. Learn more about When should you tag external links as nofollow. Image optimization is an essential part of SEO as well. People search for images almost as much as they search for text. Hence it is very important that you make the images on your site easier to find. Always add titles to your images. Search Engines look for titles. Add ALT tags as well. These help in user-accessibility. People who are visually impaired use special browsers to use the internet. These browsers spell out an image's alt description for such people. Hence, add this attribute to help your disabled fellows. What are blog labels or Categories? Search engines love fresh content. But then again, who doesn't? People are looking for new content every time they visit your website. Whenever I visit any site, the first thing I look for is the time stamp under the latest post. That gives a very good idea of how frequently a website is updated. Service websites don't need to be updated so frequently. But content related sites and blogs must be updated frequently. For blogs, a post frequency of at least one post per day is very important. The more, the merrier. But try to write at least one post per day. It makes your site look fresh, and also improves your Alexa rank. And the more the topics you have written on, the more traffic you'll get. A slow loading blog does not fare very well with readers. You'd think search robots would have no problem with this. But unfortunately, that isn't true. And it's logical too. Google has to return millions of search results in a split second. It does not like a site bogging down its search bot. Do not upload too many heavy files to your blogs. Rather, upload big files on sharing websites, and provide your readers with a direct download link. For more information about how to reduce blog load time, check out the article below. 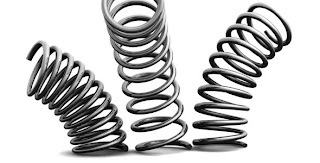 Reducing bounce rate is key to your blog's success. Bounce rate is the amount of people who leave your website during the first few seconds of their visit. The lower, the better. Blog load time can effect this rate. But the most important factor is website design. An attractive and elegant design will retain visitors, while a website which is difficult to navigate, is cluttered up with ads, or has faulty design will lose visitors quickly. Of course, the content quality and frequency also play a part. So work on those areas and reduce your bounce rate. Typography refers to your content styling. Who doesn't appreciate good styling? Good includes things like italicizing or bolding text, proper line spacing, headings, padding etc. Work on these to make your content look good and easily readable. Once you are done with some basic SEO, you need to validate and check it for any errors. 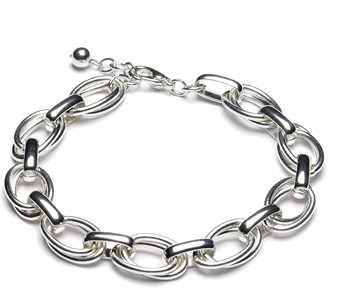 Start by checking any broken links. There are Blogger and WordPress plugins that help you do this. But you can do it manually as well by visiting the W3C Link Checker. Next, you need to visit the W3C HTML Validation Tool and W3C CSS Validation Tool for validating your HTML and CSS for any errors. After that, you can validate your SEO by using a good SEO plugin. Such plugins are available for both Blogger and WordPress. Complete List Of SEO Tactics For Blogger Blogs! Good Post! Now Mohammed's 13 Killer seo tactics become 20 Hot seo tactics ! Thanks! I just want to add one suggestion,don't name the images like "top 20 SEO tips". Instead use "-" or "_" to fill the space between the images. you are really great qasim i think that mohammed was not wrong when he chose you as an author for his amazing blog. I hope you also see my new blog. Qasim Thank you man you give us a lot of huge Info That's cost a lot thanks. Really informative and detailed post. 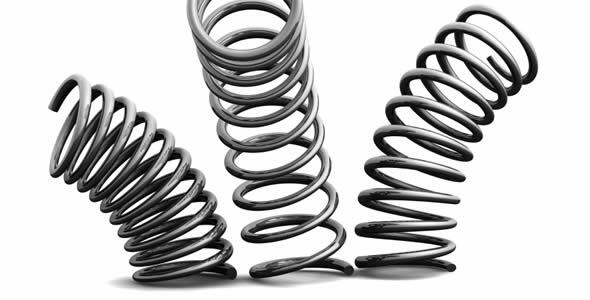 Interlinking and updating frequently are the most important aspects of better SEO. Thanks for sharing this useful post ! well written post. in posts at some other sites i have found some tricks are given which are misleading. I happy to find many good point here in the post, writing is simply great, thank you for the blog. Very nice sharing thank you so much. Useful tips to rank a website.I think keyword analysis is required at first step.Creating back links on page ranked website another way. If anyone have blogs they can use smm APPS to increase visitors. Thanks writer to present this informative article. thanks for sharing blog post 20 hot seo tactics every use. Thank's to share your experience with us..Nice post . How to add meta keyword per post in blogspot? I will go with your points as you said..If the content is good really we can get the good result.. Simply Great Article on SEO. Please check SEO Exclusively For Blogger. amazing article on SEO tricks..I will follow all these techniques on my blog http://www.webcodeexpert.com/ to make it more SEO friendly. I also have implemented many tricks suggested by you and also suggest others to follow these tricks. This topic is very helpful for SEO. Pls Click Here to visit my blog for SEO Tutorials. 1. 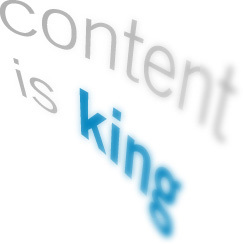 Content - write a good content that is updated regularly in your website/blog. 2. Text styling -Make bold or use any different font style to highlight your keyword. 5.Add interactive features to your website. No doubt all the 20 tips for SEO discussed in this blog are effective and they are indeed helping businesses to get higher ranking. I must say, your SEO articles are really awesome and an ultimate guide for webmasters to improve websites ranking. The SEO practices discussed here are playing quite well in educational websites as well, as we have noticed a great boost in audience and search traffic of best online executive MBA course provider university's site. This is very informative search engine optimization techniques especially to newbies! It is true that having to start to formulate your niche with your blog is very challenging. Thanks! This is very helpful! I am new in this work so i have read a post on Introduction to Seo on the blog. It is extremely helpful for me related post SEO Malaysia . Thank you for taking the time to discuss this, I feel strongly about it and love learning more on this topic. If possible, as you gain expertise, would you mind updating your blog with more information? And if you want health tips and products check this blog. How to Prevent Heart Attack ? Business CompetitionFastidious blog you’ve got here. I’ve ever been seeing you just about many blogs recently. open multiple linkThank you so much you have given the great blogs site by which we can get more advantage.